As part of the EduBlogger World first ever virtual meetup and unofficial launch day on August 23 this blog post is a brief look into my educational blogging world. Who am I and why do I blog? I am an international educator who firmly believes the walls of the classroom should be lowered and/or flattened so that all participants in the process of learning can be part of the global community and share their experiences and thoughts as they feel inclined. Right now I am blogging at the dining room table as we have been living in this new apartment in Qatar for less than one week. If it was daylight this is the image I would see outside the window I am sitting next to: The wall of our compound and over that the desert with occasional houses. 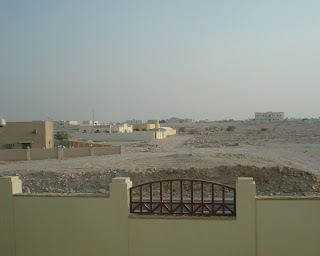 Our Qatar Foundation Education City Housing, like many other places in Qatar, is surrounded by stretches of desert with clumps of houses. Educational blogging is a valid and worthwhile method of communication and promotes and supports best practice approaches in the classroom as well as higher order thinking skills. Are you an educational blogger? Join us at EduBlogger World. Don't forget the virtual meetups on August 23! Also don't forget we are looking for Global Greeters in every country. Thanks for showing us your window to your Edublogger World. That is such an incredibly different view than from my window. I would love to read more on your life, and adventures in Qatar. I would also like to thank you, Darren and Vicki for all your efforts in organising this network of educators. We do appreciate it.